Tina's family has set up a schoolroom in their living room, although, being homeschoolers, they feel free to work anywhere throughout the house. 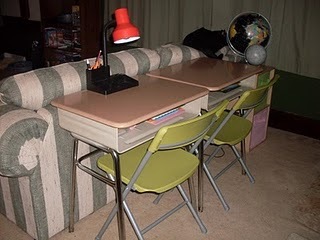 They have maximized space in their family room by utilizing the area behind the couch for desks and bookshelves. Tina says, We don't really have a school room, per se...because we don't have what I consider to be a school in many senses of that word? The girls do have desks, purchased for just $10 each last fall from another home-educating mom, and they do a lot of their bookwork here, for convenience-sake if nothing else. But they're not in a classroom; instead, they're in one part of our large living room and, actually, blend in with the other decor rather nicely. 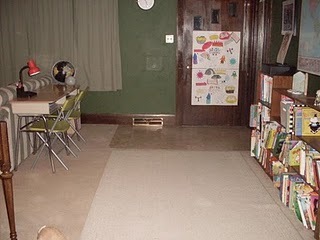 You can learn more about this school room by visiting Tina's blog.